To 650 km of the Ness Log, Stonehenge dates from the bronze age and represents the biggest prehistoric structure in Europe. Four sets are encased. Largest, 30 meters in diameter, is formed large rectangular blocks out of sandstone. At the interior, second is made of smaller blocks. Then a whole of triliths (i.e. two vertical stones surmonted by a horizontal stone) out of horseshoe. Lastly, a block in the center evokes a kind of furnace bridge. The whole is surrounded of a ditch 104 meters in diameter and of a slope with 56 wells. What one knows, it is its historyn : the circular pit and the slope are set up into 3050 before J C, then a timber structure is built in the center towards 2500, followed circular monument until 1500. But for what is it used ? Some see it like an astronomical function (prediction of equinoxes and solstices, prediction of eclipses, solar and lunar calendar...). Many people privilege the certainly least probable but most known assumption : reception's area for extraterrestrial vessels. The best assumption remains that of a place of ceremonies. In 1997, the Telegram publishes an assumption according to which the monument is of Breton origin. 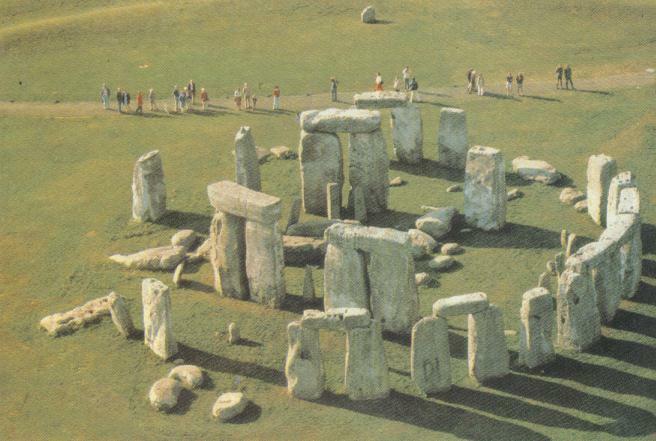 Indeed, a circle in the center of four stones indicates the hours to sleep and of raising sun as to Brittany, the horseshoe is found only in Er Lannic (Brittany), and an axe, non-existent in Great Britain, is represented on a stone. However, the assumption is contradicted by the fact that Er Lannic doesn't have astronomical contents, and that the times are completely different.